The backbone of type is the array of Jungian cognitive functions, whose preference in a dominant or auxiliary fashion define each of the 16 types. We can think of them in terms of how a computer works: input, processing and output. We take in information, process it, and then act upon on it. Our cognition can be thought of as basically answering “yes or no” ("tenable": 'able to be held' as a personal view, or "viable": able to be acted on; or not), and the "input" breaking "yes/no" down into what "is" or "isn't", which then breaks down into either "known/unknown" (in a tangible sense) or "guessed" or "naysayed" (i.e. denied, even without complete evidence). The "processing", or making rational decisions, breaks the yes/no down into "right" or "wrong" (often leading to the action or "output" of trying to make things "right"). This further breaks down to an impersonal "true/false", or a more "person"-affecting "good/bad". 2) What are the proper relationships between things? (processing). (Then, how we respond to the processed data will form the basis of our "output"). The two functional poles for each question determine the type of information or relationships being processed. They really represent artificial divisions of reality, where each person pays more attention to one aspect of experience or the other. For the input (data-gathering) processes, these will correspond with the "dimensional" divisions of space vs. time. Of the four coordinates "events" in the universe are plotted on, three of them are random-access, meaning you can go back and forth between different points. This is called "space", and by interacting through it, we can therefore locate or come into contact with objects at different points using our senses. The remaining dimension is "time", which is one-way in progression, and thus we cannot return to previously visited coordinates, and also, cannot access ones we have not reached yet! (And we all travel together, through the same point every instance). While a special form of sensation we will introduce below can look back at the previous points of time (but still not actually return to them), we must use a different, non-sensory form of perception to access this dimension overall! This will follow the "patterns" of things and events through the time dimension, and by which we can get a sense of what may happen in the future, and even things that may have happened in the past that were not experienced via sensation, and also, perhaps why things are the way they are now. For the data-processing, these will correspond to the nature of objects in the universe: things vs. people. One function will pay attention to things, while the other will be more about considering the affect of things on people. Sensing (S) and iNtuition (N) are the information-gathering ("Perception") functions. Sensing deals with experience of what's tangible (often called "concrete"), in which we consciously register reality as picked up by the senses (through space) as significant in its own right (rather than taking it for granted), while iNtuition deals with implications drawn from reality (through time), or inferring what's intangible or conceptual, such as "larger contexts", "ideas" of things, and symbols (often called "abstract"). Thinking (T) and Feeling (F) are the decision-making ("Judging") functions. Thinking deals in evaluation based on simply how things work, which is also known as “technical”, and more popularly, “logic”, which can be expressed in terms of what's “true” or “false”. Our reactions to things will tell us about the object itself. Feeling evaluates or sorts out our personal feelings or emotions (though it's NOT the emotions themselves), which are determined by the affect of things on human souls. Our reactions will tell us about the state of our souls. Thus it will often deal in values and ethics which have more of a "humane" dimension; often determining "good/bad". The resultant eight combinations are then called "function-attitudes" or sometimes, "processes". Extraverted functions draw directly upon the external environment of "objects" or situations, while introverted functions draw on an internal model of situations referenced individually by the "subject". With judgments (T/F) in particular, introverted perspectives will be what one has learned also through nature (hence often dealing in "universals"), while extraverted perspectives are generally acquired from culture (such as consensus). The attitudes also often thus end up applied in the realms where they derive, or our "energy" is described as "flowing" in that direction. Of these eight function-attitudes, one will be "dominant", which makes it the ego's main perspective. A function of the opposite rationality (judging T/F if dominant is perceiving S/N, or perceiving S/N if judging T/F is dominant) is then "auxiliary", and also in the opposite attitude. 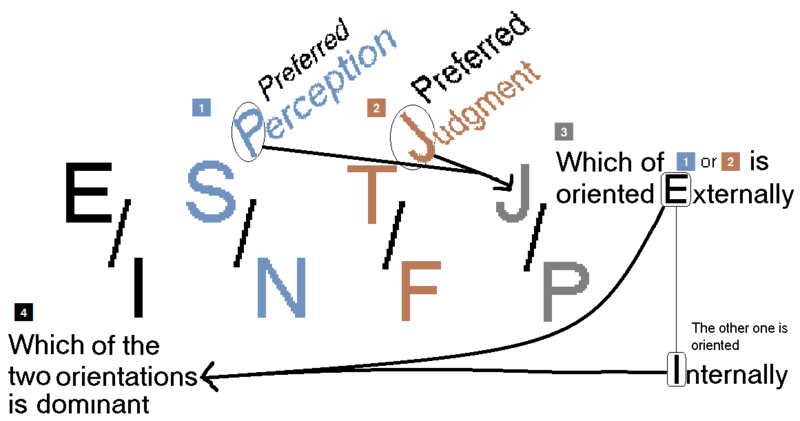 This is what defines the MBTI® type, with the middle two letters of the four-letter code being the two functions (S or N, followed by T or F), and the outer two letters indicating their position and orientation. The other two nonpreferred functions will become the tertiary, which is the opposite function from the auxiliary, and the inferior, which is the opposite of the dominant. The J and P at the end of the code tell you which of the preferred functions is used in the external world, and from that, E and I at the beginning tell you that either the external or internal one is the dominant function. The other six function-attitudes are basically ordered by their archetypal position within the ego. To start to understand the function-attitudes, we can look at the common human "faculties" they are associated with. Extraverted Sensing (Se) involves the basic senses, of touch, taste, sight, hearing and smell. Introverted Sensing (Si) is involved with "memory", where we store our sensory experiences to bring back up to consciousness to compare with current experience. Now, the natural mistake to make is to define simply "Se=current experiences" and "Si=memory". This is not totally true. For one thing, only certain types have a normal preference for Se or Si, but every person has both current sensation and memory! So the function-attitudes are specialized attention to the data taken in through the faculties, as used by the ego-structure. The conscience (associated with Fi products; our own human values used to relate to others). Also, these functions are often treated as skills or behavior. But they don't always line up with behaviors. Like a Thinking type having strong feelings about something, and then having to wonder if he might be an F type. A better way to define the functions are as perspectives. It is often phrased that a person "uses extraverted Thinking" (Te) to organize his desk. Instead, he sees a disorganized desk through the lens of Te; in which it is deemed incorrect by an environmental standard of efficiency, and then makes a logical decision to organize it. These functions involve the ways the emotions interplay with our "rational mind". Every person goes though life having to process both concrete and abstract information, and then make both impersonal (logical) and personal (value) judgments. Where type theory begins, is in the way this processing affects us emotionally. They carry what can be called a "sense of meaning" when brought into consciousness by the ego, and when not conscious, come out as felt reactions. In consciousness, they become the "interpreters" of these emotional events. The functions are differentiated when a greater value is given to those choices where emotion and reason are in synch. When we use a function that is destined to become "preferred", we feel an emotional investment in what we're doing, so we keep on doing it. The function then appears to "develop" or get "stronger", and behaviors associated with it will increase. Se: what's "known" (tangibly) determined by whatever is physically before you; "apparent reality"
Si: what's "known" (tangibly) determined by whatever you remember physically experiencing; "self-referenced reality"
Ne: what's "guessed" (inferring "where it's heading") determined by the objects involved themselves; "apparent implications"
Ni: what's "guessed" (inferring "where it's heading") determined by internally derived imagery; "self-referenced implications"
Te: what's "correct" (i.e. impersonally) determined by environmental mandate or necessity; "revealed truth"
Ti: what's "correct" (i.e. impersonally) determined by individual reflection: "self-determined truth"
Fe: what's desirable (i.e. to people) determined by environmental mandate or necessity: "revealed good"
Fi: what's desirable (i.e. to people) determined by individual reflection; "self-determined good"
MBTI theory most often outlines four functions, the dominant, auxiliary, tertiary and inferior, for each of its 16 types. Since there are eight different function-attitudes (also called "processes"), this often raises the question of what about the "other four". The first step to answering this is to realize that in the way Jung conceived the theory, there were only four functions, S, N, T and F, and the two possible orientations the ego can engage them: externally and internally. The ego chooses its dominant orientation and function. So then that function becomes paired with the orientation into what is called "function attitude". The other orientation and functions are initially repressed into the unconscious. (From here, it should be pointed out that we all still use all the functions, but there are more "general" and "special" uses of them; and it's the "special" uses that connect to the type "preferences" we are discussing here). The other three functions become paired with one orientation or another based on the archetypes that lie in the unconscious. At first, it was believed that all three functions were of the opposite orientation from the dominant. This kind of made sense, as everything that has been rejected by the ego basically "collects" and thus comes together, in the lower ranks. Yet then, it was determined that the tertiary was actually the same orientation of the dominant. The auxiliary and inferior remain in the opposite orientation. So you ended up with four function-attitudes out of eight. The other four, then, are basically pairings of the four functions with the orientations opposite of the ones assigned for them in the first four. It is a collection of perspectives (recall; that's what functions are) repressed from the consciousness. The best way to understand how all eight will play out in a type is through the “Archetypal Complexes Carrying the Eight Functions” outlined by John Beebe. These basically create type-specific roles of the functions. To understand the "other four", we must understand the archetypes of the first four. First, what really is an archetype? To begin, we should start with a more familiar concept, of the complex. The best way to understand complexes, are as ego-states, which are lesser senses of "I" (this book: Ego States: Theory and Therapy, John G. and Helen H. Watkins, W. W. Norton & Company, New York, 1997; and this paper: http://www.ptintensive.com/images/Journal_3-2_Ego_Surrender.pdf explains this well). You have the main "I", the ego, which usually has "executive control" over our conscious life, generally perceiving or judging through its dominant function; and these other, lesser "I"s, (which can be many different states of the ego, like happy, sad, optimistic, pessimistic, etc. sometimes saying and believing opposite things from each other!) which come up, and can lead us to use other functions. A group of certain of these complexes are what were identified in Beebe's theory. So for each type, each associated function will end up becoming the main perspective of that complex. Complexes are at their root, archetypes that have filled up with personal experiences. An archetype is a sort of model of a person, thing or event, that lies in our unconscious. Also phrased as "a way of organizing experience". These consist of "emotionally freighted images" (such as our sense of parent and child, male and female, hero and villain, etc). So when these elements become a part of a person's individual experience, they form the "ego-states", or lesser senses of "I", which become the complexes (which will often be experienced through the emotional images of the associated archetype). These are what have become associated with the other functions in Beebe's model. The dominant function becomes associated with a heroic complex. There is also the Persona, which is the image we like to present to the outer world. The auxiliary, a parental complex ("mother/father"). The tertiary, a "child" complex ("puer/puella"), and the inferior, an inferiority complex, also known as the "anima" or "animus" (Which deals with our sense of "completeness" outside ourselves). These make sense, since the dominant will be our main perspective, and what we trust the most to solve our problems. The auxiliary will be about support, and thus become what we tend to help others with (as well as balancing the dominant by supplying data for one's dominant judgment, or organizing one's dominant perceptions, and also referencing the opposite of the dominant's individual or environmental orientation). The next two, being further down in consciousness and less mature, sort of mirror these. The tertiary will tend to be what we look up to others as a child with, or play and find relief. The inferior will be the most vulnerable, and deal in feelings of incompleteness (which we might not be fully conscious of). Based on a hypothesis on the tertiary, it is likely the Puer complex that orients the tertiary function to the dominant attitude as our first line of defense in defending the ego's goals. This is what set the familiar order of the first four functions for each type. This gives us an idea of how the complexes shape the manifestations of the functions. "The Shadow" was originally one single archetype; consisting of all those unconscious things within ourselves that we tend to project onto our "enemies". It became associated with the inferior in other versions of the theory. In Beebe's model, it becomes divided into the other four archetypes, which are really negative versions of the first four. The hero becomes a "negative hero" called the "Opposing Personality". The parent becomes a "critical parent" associated with Jung's Witch and Senex. The child becomes a 'bad child' known as the Trickster, and the inferior becomes a "negative anima" called "The Demon". These carry the repressed aspects of the first four, through the same four functions with the orientations reversed. The Opposing Personality, employing the dominant function in the opposite attitude, defends against what the ego feels obstructed by. The witch/senex "parents" others negatively by casting blame and negative attacks, especially when we feel negated, via the perspective of the auxiliary function in the opposite attitude (or same attitude as the dominant). The trickster creates double binds to trap others when we feel bound in some way, involving the tertiary in the opposite attitude. The demon carries a connotation of destruction or evil. It is when the ego feels threatened with death through the removal of its boundaries. This involves the inferior function in the dominant attitude. According to Beebe, the dominant, inferior and their shadows are "spines" of consciousness, dealing with the ego's relation to self, and the auxiliary, tertiary and their shadows are "arms" dealing with others. This provides more clues as to how their roles play out. Here we finally get into the third part of the processing, the "output". This is how the preference will tend to manifest through our behavior. This is through the older form of "personality" theory, temperament. Extraversion and introversion are apart of both MBTI type, and the classic four temperament theory. The other factor in temperament was people vs. task-orientation. This paired Sanguine and Choleric as extroverts, Melancholic and Phlegmatic as introverts; Sanguine and Phlegmatic as people-focused, and Choleric and Melancholic as task-focused. David Keirsey’s version of the temperaments (SJ-SP-NT-NF) instead employed MBTI's Sensing/iNtuition; and a new factor called "Cooperative-Pragmatic", using alternating MBTI scales. Linda Berens introduced another "four type" group, the "Interaction Styles™". These were based on I/E; and another new factor: Informing and Directing, which she links to people/task, and loosely involve both T/F and J/P. Keirsey had earlier introduced and defined the factor (dividing the eight groups using the last three letters) in terms of "defining the relationship". Berens also added to Keirsey's temperaments a factor of Motive vs. Structure focus, which linked SP with NF and SJ with NT. This also appears to follow a people vs. task focus. The result is that each type shares one Interaction Style with one of Keirsey's temperaments; and each type is thus a blend of two types of temperaments! This makes it similar to other systems using blends of temperaments. Blending helps explain people who do not seem to fit into one of just four rigid "boxes". Berens had labeled the Interaction Styles as "affective" (dealing with surface behaviors such as mood and emotion), while Keirsey's temperaments were "conative" (dealing with action, striving, etc. The functions were of course, the "cognitive"). From this, I saw a connection to the FIRO-B® system, also owned by CPP, Inc. (owner of MBTI), which divides personality into Inclusion (social), Control (leadership), and Affection (deep personal relationships), each consisting of two dimensions of "Expressed" and "Wanted" behavior, matching the old temperament factors. (i.e. "Wanted" is connected to "people/task"). The Arno Profile System (APS) uses the FIRO structure under a licensing agreement with CPP, and employs the ancient temperament names in each area. A fifth temperament, Supine was added, because the traditional Phlegmatic temperament was determined to be moderate in expressed and wanted behavior, rather than particularly introverted and people-focused, as it had been assumed to be (in relation to the others), before. Both seem to fit together in the translation back to four temperament systems. My proposal is that, the Interaction Styles represent FIRO's Inclusion, and Keirsey’s temperaments represent "Control". Expressed behavior indicates a person's quickness in initiating interaction. Expressed Inclusion is how fast or slow a person is to approach others on a surface social level. Expressed Control is how quick he is to make self-initiated decisions; especially those which affect others. Wanted Inclusion is how much a person wants to be included on a social level. Wanted Control covers how much a person will allow others to influence him in decisions. The third area of Affection deals with deep personal relations. Again, expressed is how much the person initiates, and wanted is how much he wants others to initiate. This area does not seem to correspond to type. Since it is similar to Inclusion, but on a deeper level, some of the traits might be apart of the Interaction Style (that is, if the Inclusion and Affection temperaments are the same). It otherwise may explain some variations in type. (Like an introvert being more outgoing in his close personal relations). or slower when based on whether it is "right" (Cooperative). People who want less social interaction will have stricter criteria towards accepting people, will define the relationship, and thus tend to communicate to them in a directive fashion. People who want more social interaction will have lighter criteria, and be more readily accepting of people; allowing them to define the relationship, and soften their communication into "informing". People who want less control by other people will tend to have the dictates of a structure (such as an organization or their own plans) to set the criteria that must be met for them to accept that control. People who allow more influence by others in responsibilities will be more likely to take into account others' motives "in order to work with them" (Berens). Here are the "blended temperaments" that result, using the original four temperaments. (The fifth temperament, Supine, is interchangeable with Phlegmatic). Statistical correlations between FIRO and MBTI, and my own informal studies on people online yielded results supporting this to some extent. The purpose of correlating the two systems is that it gives an additional perspective in type behavior, and shows the blends of temperaments in each. For instance, I have seen ISFP's question their SP preference. SP is a kind of Sanguine, which is a very active extrovert, which often influences the general temperament descriptions (especially in Keirsey's profiles which focus on the temperaments more than the types which are seen primarily as "variants" of the temperaments). Yet this might not match the way the ISFP sees himself. However, this correlation shows that the ISFP's "Sanguine" behavior lies in the area of Control, not Inclusion (social behavior). When seen as covering his leadership or action skills, the ISFP more easily identifies with the active, "pragmatic" SP descriptions.